Since entering the league in 2000 as an expansion team, the Columbus Blue Jackets have played 15 seasons without winning a playoff series. Although the team has not been able to perform as well as they’d like, there have been a number of individuals who have had excellent careers in Columbus, including a couple of current players who instill hope for this team for the present and years to come. Let’s take a look at the top five Columbus Blue Jackets of all time and let the debate begin! Drafted 4th overall in the 2000 NHL Entry Draft, Rostislav Klesla was the first ever draft selection in Columbus Blue Jackets history. Although, his offensive output has never been anything monumental, Klesla was a solid two-way contributor. Klesla scored 133 points form the back end and played in 515 games for the Blue Jackets, third most in franchise history. Rostislav Klesla was a Blue Jacket through and through for parts of 10 seasons. He was a fan favourite during his time in Columbus and certainly deserves a spot in the top 5 Blue Jackets of all time. David Vyborny was one of the more prolific scorers in the short history of the Blue Jackets. He currently sits third in goals scored (113), second in assists (204), second in points (317) and second in games played (543). Vyborny played all seven of his NHL seasons with the Blue Jackets, leading the team in points twice in 2005-2006, 2006-2007. Vyborny was a solid contributor throughout his career posting three 20 goal seasons and always being a dangerous threat in the shootout. In three short seasons, Sergei Bobrovsky was able to cement himself as one of the best Blue Jackets of all time, but as the best goalie in franchise history. With all due respect to games played leader Marc Denis and 2009 Calder Trophy winner, Steve Mason, Bobrovsky has run away with the title. In his first year with the Blue Jackets, Bob was named the winner of the 2012-2013 Vezina Trophy as the leagues top goaltender and named first team all star. His numbers as a Blue Jacket include a 2.39 G.AA and a save percentage of 0.923% – both significantly better than anyone else to suit up in Columbus. He sits third in games played for the franchise at 147, less than Denis’ 266 games played and Mason’s 232, yet his 83 wins are just one behind Denis’ 84 wins and 13 behind Mason’s. He is the best goaltender to play for the Blue Jackets and perhaps the most important player the franchise has had as he has the ability to steal numerous games for the team. After the 2015-2016 season, Sergei Bobrovsky should be leading the Blue Jackets in almost every major goaltending stat category. Ryan Johansen has 4 seasons of NHL experience under his belt. His first two seasons as a Blue Jacket he scored a combined 33 points in 107 games. How does a young guy like this rank second on an all time team list? Well, in his next two seasons, Johansen took the NHL by storm by posting 134 points in 164, a point per game of 0.82. Ryan Johansen was drafted fourth overall in the 2010 NHL Entry Draft and took a few years to develop, however, now that he has he is a force to be reckoned with. Ryan Johansen is the first bona fide number one centre the franchise has had. He is the top offensive threat, the catalyst to the Blue Jackets offence and the first real threat at taking over the top spot on this list if he continues to perform on the ice. Who else could be at the top of this list other than likely future Hall of Famer Rick Nash? Columbus Blue Jackets all time leader in goals (289), assists (258), points (547), games played (674). Co-Winner of the 2003-2004 Maurice Richard Trophy for leading the NHL in goals scored with 41 (tied Jarome Iginla and Ilya Kovalchuk). An NHL All-Star as a Blue Jacket for 200, 2007, 2008, 2009, 2011. Rick Nash was an elite goal scorer during his time in Columbus and continues to do so for the New York Rangers. 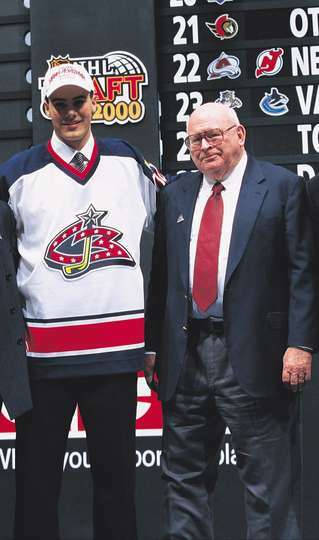 The 2002 first overall draft pick lived up to his name and more for the Blue Jackets as his 289 goals he scored in Columbus is 51 more than Alexander Semin’s 238 career goals – the next highest goal scorer taken in the same draft. Rick Nash is the best player to wear the Columbus Blue Jackets uniform. Umberger was a fan favourite and a heart and sole player during his time. He has comparable point per game numbers to David Vyborny, sits third on the list of all time scorers and had an excellent career in Columbus.